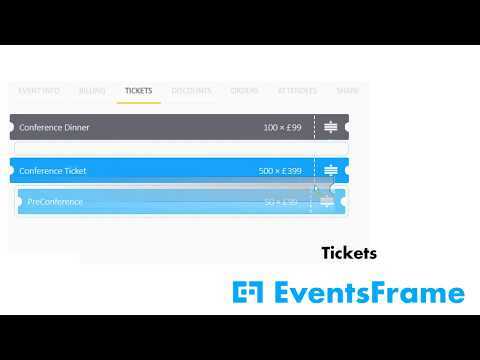 EventsFrame is an online event ticketing solution which allows vendors to manage tickets, sales, orders, and attendees for multiple events. Users can create an unlimited number of tickets and ticket types, and offer a variety of discounts including ‘earlybird’ pricing, group discounts, and combo discounts. Integrations with Braintree and PayPal enable credit card payment processing for online ticket sales. Support for ‘sub-tickets’ allows users to offer ticketed workshops, dinners, and other optional events once attendees have purchased the main event ticket. Additional attendee information can be recorded using custom fields, which can be implemented at either the organization or individual event level. Current and past events can be tracked through the EventsFrame homepage, and users can export sales, order, and attendee data at any time. Overall its been a great time saver and has made running or managing event easy. As the software makes planning and organising the vents smooth and fast your can invite fellow teachers, parents, etc for Professional development with no hassle and a clean layout. I cant wait for extra features to be added in the future!Clear and easy pricing without hidden fees. Easy to use, yet powerful! Having used various other and similar event-organiser platform I've always found the set up and final fee structure complicated and difficult to navigate. With Eventsframe it's clear what you get for free and what you are given extra for the premium offering without them trying to hide or slap on extra fees for special deals. The customer support is top and you can really tell that the people behind the platform have a good understanding f what it takes to run events. They understand the workflow of organising an event and this is represented in the way the support is given. I would definitely recommend EventsFrame to others! Clear and easy pricing without hidden fees. Easy to use, yet powerful! Having used various other and similar event-organiser platform I've always found the set up and final fee structure complicated and difficult to navigate. With Eventsframe it's clear what you get for free and what you are given extra for the premium offering without them trying to hide or slap on extra fees for special deals. The customer support is top and you can really tell that the people behind the platform have a good understanding f what it takes to run events. They understand the workflow of organising an event and this is represented in the way the support is given. I would definitely recommend EventsFrame to others! So far I have not come any Cons. The pricing of the premium could be considered a con by some, but personally I think it's great value for your money. Again the price is just that, no hidden fees. So when you do decide to go with a premium offering you know what you're paying and what you're getting. It's an events platform developed by an events company. The interface is very straightforward, not intimidating. Creating and/or editing tickets is very easy. I love how easy it is to create discounts. I've tried other online ticketing system before and managing multiple / overlapping discounts was a pain. EventsFrame made our process much more efficient. The interface is very straightforward, not intimidating. Creating and/or editing tickets is very easy. I love how easy it is to create discounts. I've tried other online ticketing system before and managing multiple / overlapping discounts was a pain. EventsFrame made our process much more efficient. It's fairly new and have very basic features. I hope they add an Analytics dashboard but overall, it's a great system for managing events. It is free and a perfect solution for our event registration management!- easy to navigate - versatile when in comes to features you want to request from support team. - offers wide range of accepted payment methods - event organization made easy! - easy to navigate - versatile when in comes to features you want to request from support team. - offers wide range of accepted payment methods - event organization made easy! please incorporate more more helpful features such as, visibility on abandoned orders, offer notification options to event organizer. I only regret that I did not know earlier about this software... ;-) To me, there are no cons. easy to create eventsWe run internal events for our company and have been using EF for the past two months to make events. Generally it works well and is very simple. Attendees seem to like it....at least we had no complaints yet and they all registered ok.
We run internal events for our company and have been using EF for the past two months to make events. Generally it works well and is very simple. Attendees seem to like it....at least we had no complaints yet and they all registered ok.
Bespoke packages are also available - contact EventsFrame for pricing. A range of discounts can be created, including ‘earlybird’ discounts, bulk discounts to incentivize group attendance, and combo discounts, which can combine multiple discounts for a single purchase. Sub-tickets can be created and offered to attendees once they have purchased main event tickets, allowing users to offer ticketed workshops, pre-event dinners, and more. Custom fields can be set up to record additional information about attendees, such as dietary preferences and t-shirt sizes, with the ability to add fields at the organizational level or for individual events. Tickets and event registration pages can be previewed before publishing, and published event links can be sent directly to potential attendees or embedded in websites. Links to all events can be accessed through the EventsFrame homepage, broken down into All, Current, and Past, with events stored in the Current tab for 10 days after the event has finished. Below are some frequently asked questions for EventsFrame. Q. What type of pricing plans does EventsFrame offer? Q. Who are the typical users of EventsFrame? Q. What languages does EventsFrame support? Q. Does EventsFrame support mobile devices? Q. Does EventsFrame offer an API? No, EventsFrame does not have an API available. Q. What other apps does EventsFrame integrate with? Q. What level of support does EventsFrame offer?